Spoiler Warning: This article contains light spoilers for Boku no Hero Academia The Movie: Futari no Hero. Proceed at your own risk. "To save people who need help right in front of you… that's what it means to be a hero." The Boku no Hero Academia franchise exploded onto the anime scene when it aired its first season two years ago. Since then, two more seasons and a series of specials have been released to rapidly growing popularity. Naturally, a movie soon made its way to the big screen. This movie, Futari no Hero, not only provides further insight into the backstory of All Might and what made him the hero he is today, but also conveys a meaningful message. The events of Futari no Hero takes place between the second and third seasons of the show. 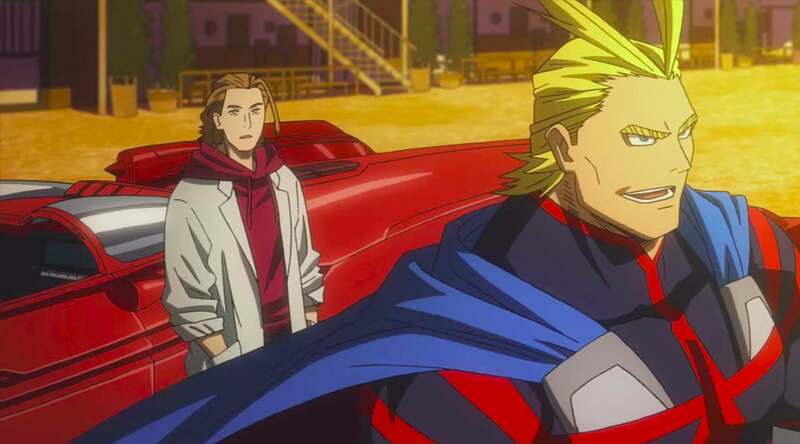 The movie opens with an action-packed flashback to when All Might was a dashing young college student studying in America. In this scene, he is accompanied by his friend David Shield as he intervenes in a comical bank robbery. All Might is seen as the embodiment of Western superhero comic characters, particularly Superman. Both are symbols of truth and justice with similarly flashy super strength, have a life with a deceivably weak alter-ego, and a Yankee attitude. This metaphor is only further supported by this particular scene. In this flashback, I couldn't help but chuckle at the parallels between the pair and other superhero characters. David and All Might ride around in a superpowered car much like Batman and Robin; All Might's soaring through the cityscape and David's concern about getting to class on time mirrored the hectic dual-life of Spider-Man; the pair of them seeking out trouble by monitoring a police scanner installed in their car reminded me of The Incredibles. David Shield and All Might as young heroes. Deku awakens All Might from this dream and we find out that the two of them are on a private flight to I-Island, a man-made city floating in the ocean built for the purpose of gathering and researching quirks. All Might was invited to the annual expo of scientific findings and inventions by Melissa, the daughter of his old friend David, and he decided to bring Deku along. All Might's friend David is a world-renowned scientist (a winner of the Nobel Quirk Prize) and the maker of All Might's various superhero suits. Although he is close to All Might, David is unaware of the nature of One for All. However, he knows about All Might's fading power and is desperate to fix it. While David catches up with All Might and runs tests on him, Melissa gives Deku a guided tour around I-Island. At first, I was worried that the movie wasn't going to include the other students of class 1-A, or that they would only be shown briefly. However, this fear was swiftly put to rest as each student made an appearance, one-by-one, in their own endearing ways. Clearly, the rest of the audience in the theatre that night shared my feeling of enthusiasm as cheers broke out after each character's appearance (Todoroki's grand entrance, especially). Although not every character was in the foreground of the story, the movie still showed the amusing antics that make the cohort of superpowered misfits so fun to watch. You can find a preview of this in the trailer here. 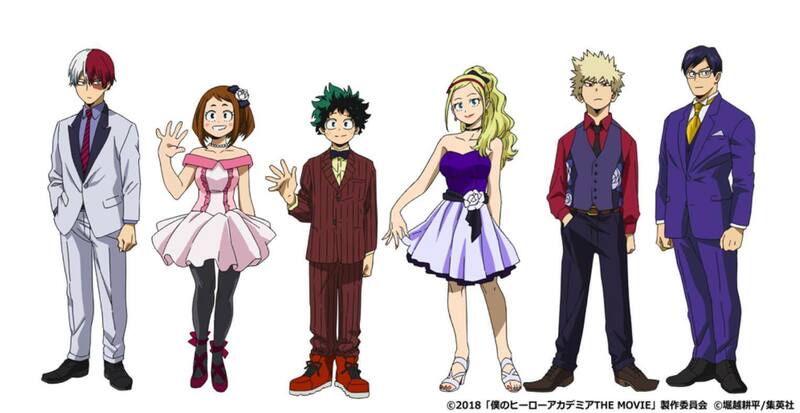 The students of Class 1-A and Melissa dressed to impress. At a formal event that most of the class attends (in which we are treated to the students wearing gorgeous formal attire as previewed above), a gang of villains takes over the security system and incapacitate all of the heroes at the gathering, including All Might. Deku & Friends were late to arrive, so they were fortunate enough to escape capture. They are joined by Melissa, and it becomes their mission to take out the villains and restore the security system. 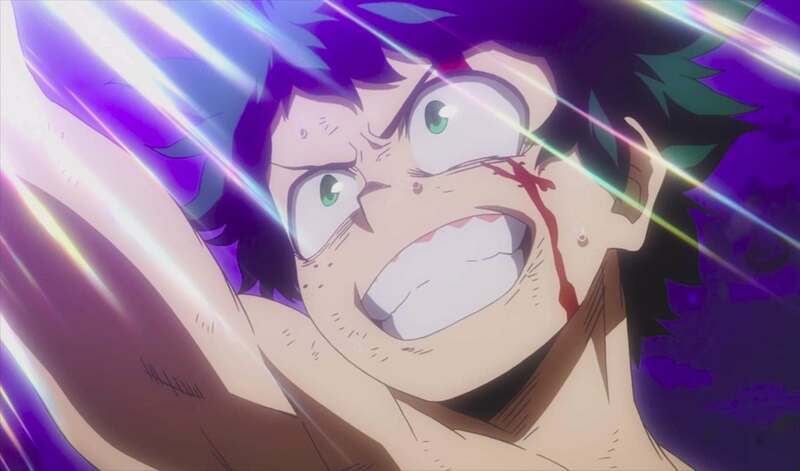 Boku no Hero Academia is no stranger to epic fight scenes depicting explosive quirks and clever tactics, but the battles of Futari no Hero stand out for one simple reason: the students of UA class 1-A use their quirks together in clever ways. The wide variety of creative and extravagant quirks in the universe of Boku no Hero Academia allows for diverse combat that is unique to the franchise and its setting. In the case of Futari no Hero, the quirks of every class member involved in the incident are combined to create compelling fights against the villains (and even Mineta has his moment in the spotlight). Support gear created by Melissa to help Deku control his power. The rising star of this movie is David's quirkless daughter Melissa. Like her father, she is an engineer that designs and constructs gadgets for heroes to use and aspires to be "a hero" as well one day. "There're so many things that qualify you as a hero. Like, it can just be the person who left these water bottles and these glasses out here for us… it's a selfless act." I mention this because this perfectly encompasses what makes Futari no Hero not only a great addition to the ever-growing franchise, but to popular culture as a whole. The market is saturated by an endless stream of superhero movies, and themes that are relatable to the general audience are often discarded in favor of excessive action, overcomplicated plotlines, or mindless fun. 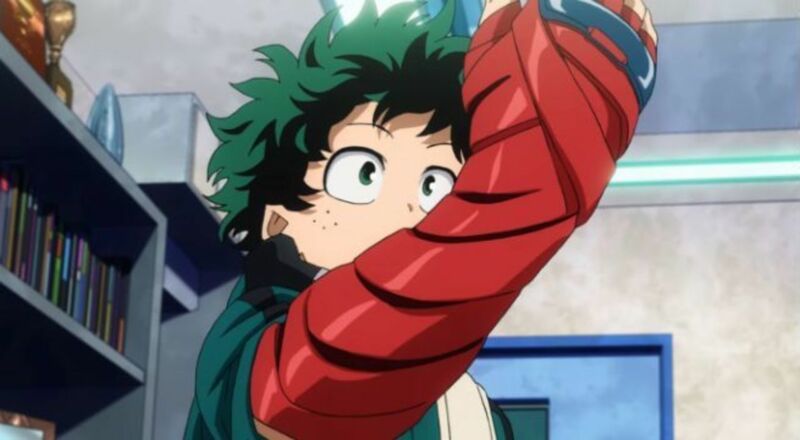 Recall the concept of "anyone can be a hero, even if they're quirkless," which is touched on at the beginning of Deku's story. Though she doesn't have the privilege of receiving a quirk like Deku did, Melissa refuses to give up and fights on as her own kind of hero. Futari no Hero may have a forgettable villain, but its upbeat nature and meaningful themes make it very memorable. Futari no Hero teaches the value and variety of heroism (even small things can be heroic), and it's truly inspirational. Deku saving people with a smile. Going into the movie without much knowledge, I was curious about the title "Two Heroes" and who or what it referred to. Initially, I came to the conclusion that it meant All Might and David since the opening scene made it clear that they were a central part of the story. As the film went on, I realised that this could also be applied to Melissa and Deku, the successors of All Might and David. David obsesses over All Might and his status as the Symbol of Peace throughout the film and would go to any lengths to protect that. But in the film's closing scene, after the villains have been defeated, David sees Deku and Melissa as his and All Might's successors, the new generation of heroes that he can leave their legacy to. 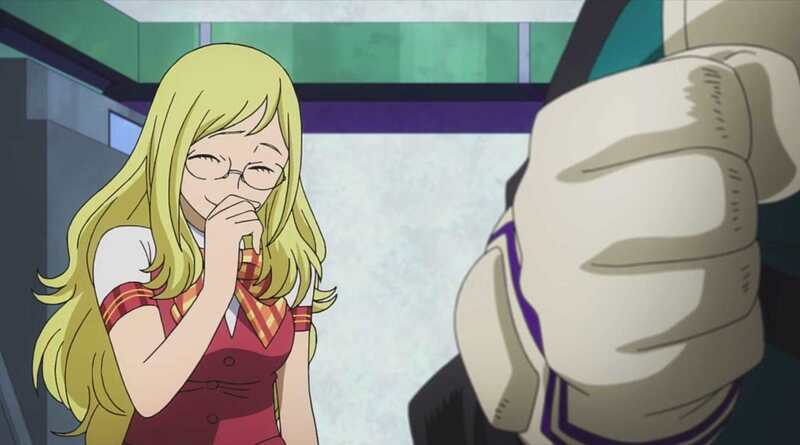 Despite the confirmation of the film's canonicity by its original creator, it's saddening to watch the development of Melissa's character and her new relationship with Deku, knowing that she could be laid aside in the main series. Deku may already have Hatsume creating support gear for him, but having a dedicated partner would give him a classic superhero assistant in the vein of Alfred, Oracle, or Jarvis. When he eventually becomes the world's greatest hero, he's going to need a hero like Melissa to have his back. Melissa chuckles at Deku fanboying over David Shield. Futari no Hero stands out, not only as an anime film and an addition to Boku no Hero Academia, but also as a superhero film in a market that is filled with Marvel and DC movies. Its blend of thrilling action scenes, impassioned character moments, and stunning animation are a must-see for fans and new watchers alike. Melissa Shield makes a fine addition to the colourful cast of heroes, and I hope to see her integrated into the main series one day. The archetypal hero is everywhere in anime. What is it about them that we love so much? Best Anime Hero: What Makes the Ultimate Anime Superheroes? Five of our writers have teamed up to bring this discussion about anime themes and characters to you! Today's topic is: Anime Superheroes- who do you think is the quintessential superhero? Our columnists have each picked a different character! Who do you agree with more?